V2V has a sixth sense that allows drivers to react and take evasive action more quickly than today&#8217;s vehicles permit. EAST RUTHERFORD, NJ – General Motors Corp. rolls out part of its experimental vehicle-to-vehicle (V2V) communication fleet for a press demonstration here. The auto maker, which currently has 12 V2V prototype vehicles – eight in the U.S. and four in Europe – is considering equipping its entire product portfolio in five to seven years with the new system, says Patrick Popp, GM’s director-global body and safety electronics. GM demonstrates its in-house technology here with a Cadillac CTS equipped with V2V, as part of the National Highway Traffic Safety Admin.’s 3-year program to develop and evaluate vehicle-to-vehicle communications systems. The overall effort is part of NHTSA’s Intelligent Transportation Systems Program. Participating auto makers provide 20% of the project’s total cost. Popp says V2V has a sixth sense that allows drivers to react and take evasive action more quickly than today’s vehicles permit. The technology enables a vehicle to broadcast its location and monitor the positions of hundreds of other cars nearby with the same capability 10 times every second. GM’s V2V system uses a transceiver that operates on a 5.9 GHz spectrum; a dedicated antenna; and a controller microchip that is the brain of the system. Existing building blocks such as Stabilitrak electronic stability control and OnStar roadside assistance complete the system. Popp says this holds down the cost of the system, but he declines to estimate what the actual retail price would be when it becomes available in production cars early in the next decade. 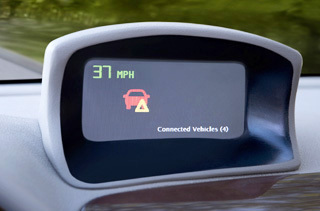 V2V can “see” around curves and larger vehicles in front of the driver’s vehicle. It communicates vehicle position, speed and heading. The most exciting feature is the ability to prevent collisions with vehicles directly ahead or behind that can’t be seen in side or rear-view mirrors. When a V2V-equipped car approaches the back of another vehicle, the forward crash avoidance component activates: A safety protocol alerts the driver and prevents a collision. It starts with a green icon displayed on the instrument panel that represents the vehicle in front at a safe distance ahead. As the second car closes in, the icon turns yellow. Then, with about 30 yds. (27 m) left between the two vehicles, the icon turns red and simultaneously the front of every seat position begins to vibrate strongly enough to awaken drowsy or distracted drivers. If all these warnings fail to get the driver to take evasive action or brake when the gap between vehicles diminishes to two car lengths, the system automatically brakes the approaching car to a stop before a collision can occur. The press demonstration here performed this with a car traveling 25 mph (40 km/h). It takes a lot of discipline for the driver performing the test to keep from manually turning away or braking. Popp says today’s sensors that provide some crash avoidance elements are very expensive, have only single-purpose applications and require line of sight. Additionally, achieving 360-degree coverage adds complexity and cost and makes the technology only affordable for high-end vehicles. OnStar provides global positioning satellite capabilities to the vehicle. And when satellite coverage is lost, Stabilitrak enables the system to determine position with dead reckoning, he says. Once the chip controllers become more affordable, they can be located anywhere in the vehicle. “But it’s best if they are located close to the antenna,” Popp says. The 5.9 GHz spectrum the Federal Communication Commission has assigned to the dedicated short-range communication protocol project has 10 channels reserved for commercial applications. Popp says some channels can be used for diagnostic and infotainment duties. However, there is no intention to give the system black-box capabilities that continuously track vehicle performance and position. Both the Institute of Electrical and Electronics Engineers and the Society of Automotive Engineers are coordinating the research and development efforts of all the auto makers belonging to the Crash Avoidance Metric Partners consortium, which in addition to GM includes Ford Motor Co., DaimlerChrysler AG, Toyota Motor Corp. and Honda Motor Co. Ltd.
NHTSA also is helping to drive standardization of the system. However, other auto makers have varied approaches to the vehicle-to-vehicle communication system. DC calls its system a vehicle information infrastructure. Not every vehicle on the highway will need to be equipped with the communication technology in order for the system to be functional. As long as there are some cars ahead of a V2V vehicle, or in its blind spots, the technology is operable, Popp says, adding V2V can run with penetration rates of as little as 5%-10%.